Make this delicious Dulce de Leche Swirl Cake recipe! Swirl in a can of dulce de leche for a sweet, creamy, caramel desert that the whole family will love! Mix crumbs, butter and 2 Tbsp. sugar; press onto bottom of 9-inch springform pan. Beat cream cheese and remaining sugar in large bowl with mixer until well blended. Add sour cream; mix well. Add eggs, 1 at a time, mixing on low speed after each just until blended. 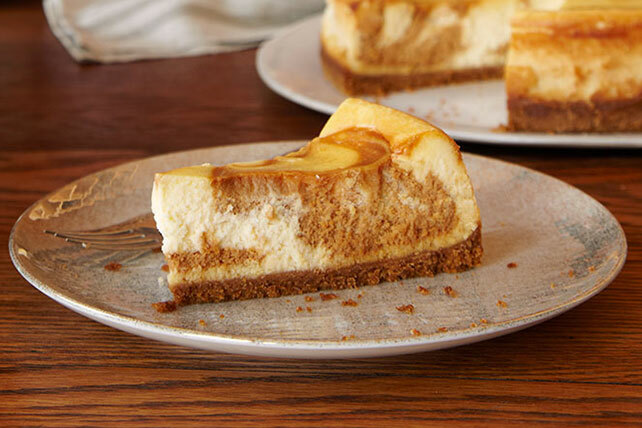 Remove 1-1/4 cups cheesecake batter; mix with dulce de leche. Pour remaining batter over crust. Gently drop spoonfuls of caramel mixture over batter; swirl gently with knife. Bake 1 hour 15 min. or until center is almost set. Run knife around rim of pan to loosen cake; cool before removing rim. Refrigerate 4 hours. Good news! You'll save 50 calories and 7g of total fat, including 4g of saturated fat, per serving by preparing with PHILADELPHIA Neufchatel Cheese, and BREAKSTONE'S Reduced Fat or KNUDSEN Light Sour Cream. Line pan with foil, with ends of foil extending over sides. Use to prepare cheesecake as directed, decreasing baking time to 40 min. or until center is almost set. Cool completely. Refrigerate 4 hours. Use foil handles to lift cheesecake from pan before cutting to serve.